Konigstein Fortress, also known as the "Saxon Bastille", is a hilltop fortress near Dresden, above the town of Konigstein on the left bank of the River Elbe. It is one of the largest hilltop fortifications in Europe and sits atop the table hill of the same name. 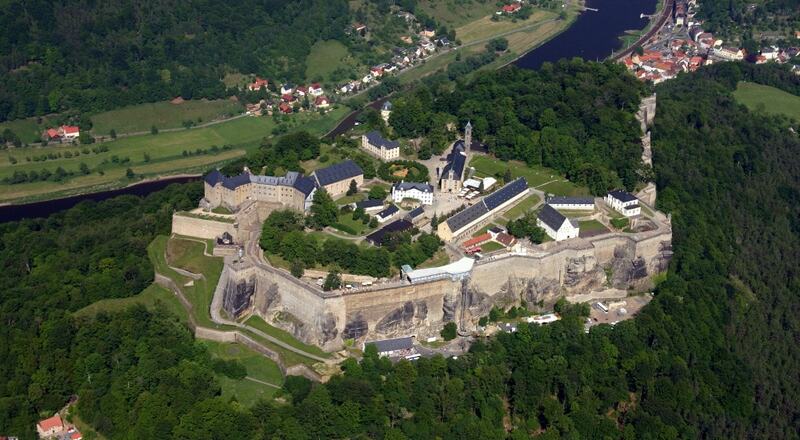 The 9.5 hectare rock plateau rises 240 metres above the Elbe and has over 50 buildings, some over 400 years old, that bear witness to the military and civilian life in the fortress. The rampart run of the fortress is 1,800 metres long with walls up to 42 metres high and steep sandstone faces. In the centre of the site is a 152.5 metre deep well, which is the deepest in Saxony and second deepest well in Europe. The fortress, which for centuries was used as a state prison, is still intact and is now one of Saxony's foremost tourist attractions, with 700,000 visitors per year.